ISLAMABAD (92 News) – Opposition Leader in National Assembly Shehbaz Sharif on Thursday assured to extend full cooperation in creation of South Punjab province and restoration of Bahawalpur province in Punjab. Taking to the floor of National Assembly, he said that the Pakistan Muslim League-N (PML-N) is considering tabling a private bill for this purpose. He said the PTI had also promised to create South Punjab province and now it should take steps for this purpose. He said his government in past had passed resolutions in the Punjab Assembly in past for the creation of South Punjab province and restoration of Bahawalpur province. He said PML-N is sincere to this cause and the treasury benches should also move forward with same spirit. On the other hand, Pakistan Peoples’ Party (PPP) Chairman Bilawal Bhutto Zardari also extended support to the Pakistan Tehreek-e-Insaf (PTI) government for creation of South Punjab province. 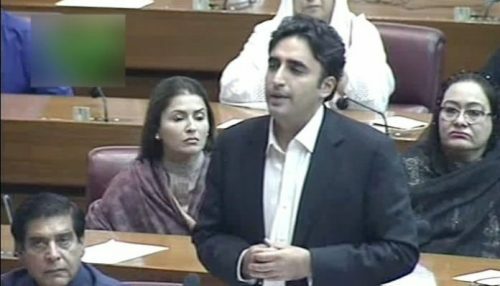 Addressing the NA session, the PPP chairman said that the PPP took stance firstly about the creation of South Punjab province. He also said that the separate province is right for the people of South Punjab. PPP had tabled the resolution in the Senate for creation of south Punjab province and got passed the bill in Punjab assembly. He lauded the NA speaker for issuing production order for Pakistan Muslim League-Nawaz (PML-N) leader Khawaja Saad Rafique.